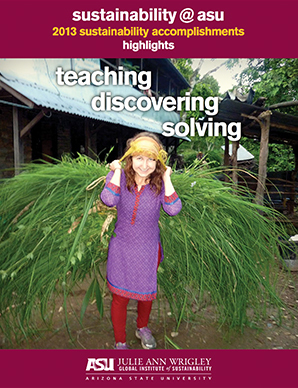 This edition gives an update on the Julie Ann Wrigley Global Institute of Sustainability’s impact and progress in 2017. 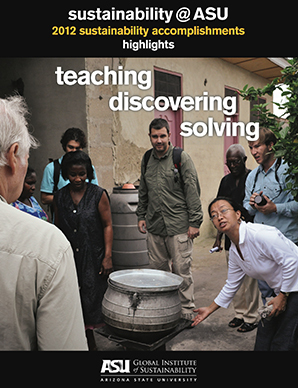 From creating a new Sustainable Foods degree to continuing the upward sustainability student enrollment trend, building international connections, and conducting award-winning research, this review highlights the institute’s growth on a global scale. This edition highlights the School of Sustainability’s 10th Anniversary, marked with a Wrigley Lecture by author and food activist Michael Pollan, a Rescued Food Feast and a Festival of Sustainability @ ASU. 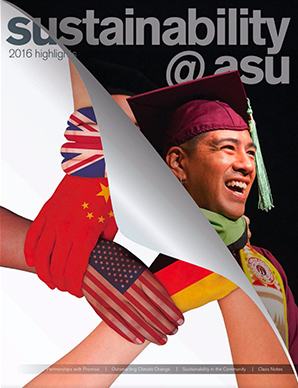 It also details ASU’s participation in promising partnerships likes the Global Consortium for Sustainability Outcomes – which unites member universities around the world in the advancement of solutions to our greatest challenges – and covers ASU’s contributions to the fight against climate change. 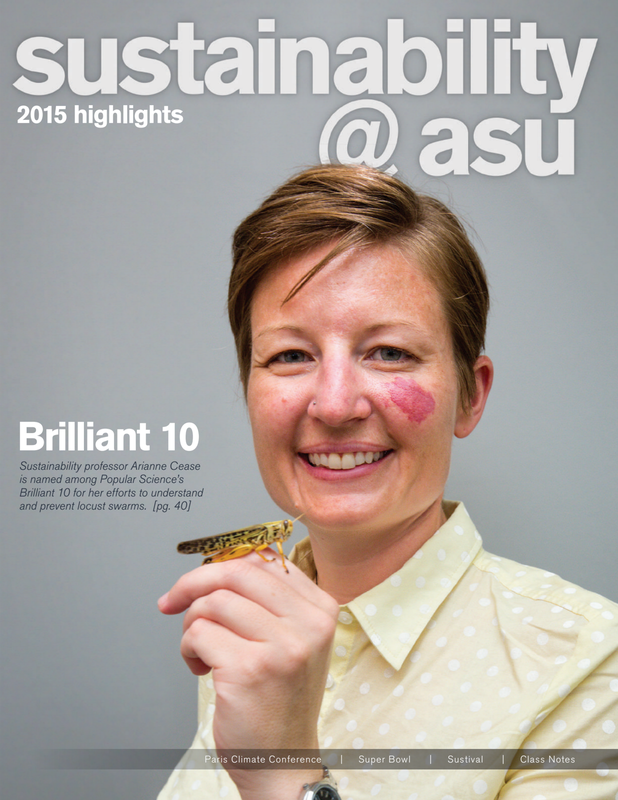 This edition features School of Sustainability professor Arianne Cease, who was named to the Popular Science “Brilliant 10” for her work with locust swarms and their connection to sustainability. A team of ASU researchers debuted a new multi-national partnership to improve urban infrastructure. The edition also highlights sustainability scientist Sonja Klinsky’s active participation in the historic COP21 talks, as well as new research that reveals online education is an important driver in sustainability solutions. 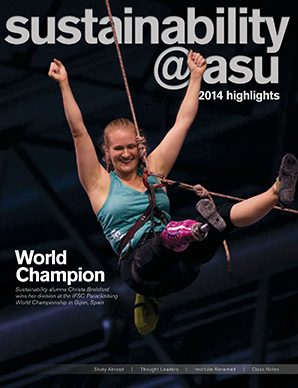 This edition features School of Sustainability doctoral alumna, Christa Brelsford, who took her division’s 2014 World Champion title for USA Paraclimbing after losing her leg in the 2010 earthquake in Haiti. 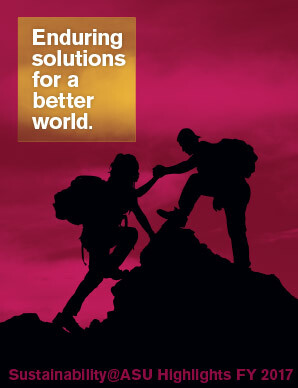 It also highlights significant milestones for Sustainability at ASU, including the Executive Master of Sustainability Leadership’s first cohort, the formation of the Resource Innovation and Solutions Network – a collaboration with the City of Phoenix – and the inauguration of the Sustainability Solutions Festival at ASU. This edition welcomes sustainability innovators Christopher Boone, Gary Dirks and Rob Melnick into new leadership roles at the ASU Wrigley Institute. The School of Sustainability partnered with Dell to engage students in a hands-on corporate sustainability environment. It also features the first graduate of the Master of Sustainability Solutions program, Karen Kao, who was also graduate convocation speaker. School of Sustainability alumni won the Sparky’s Membership Mania award for the largest increase in alumni membership for the year. 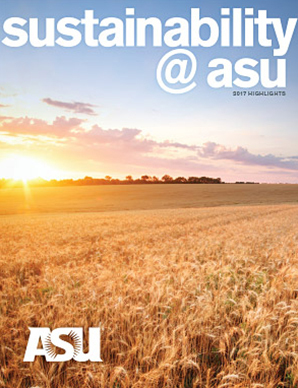 This edition celebrates the formation of the Walton Sustainability Solutions Initiatives at the ASU Wrigley Institute, as well as the founding of the nation’s first Sustainability Honor Society. School of Sustainability Dean Sander van der Leeuw was named the 2012 United Nations “Champion of the Earth for Science and Innovation.” The edition also features the installation of the PowerParasol, which provides shade for over 800 parking spaces in Tempe.